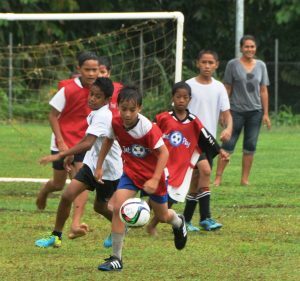 This weekend the Football Federation Samoa (FFS) kicked off its Upolu Youth League for 2018 up at its Tuana’imato Complex. Saturday’s games consisted of 13 teams for Under 10s grade and 21 teams for the Under 13 grade. Each grade is mixed with any combination of girls and boys in a 5 versus 5 format. 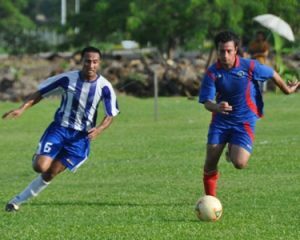 The idea behind the U10 and U13 league is the development the kid’s football skills by promoting more touches and playing a faster game. The league is also unique in that it encourages inclusiveness, creative play and removing the element of winning at all costs. FFS Technical Director Valerio Raccuglia “We believe having the girls play with the boys this will help them greatly, the size of the pitches and number of players means each player gets more touches on the ball; kids are also encouraged to express themselves without the pressure of being admonished for mistakes”. The Youth League also includes Under 16 and Under 19 grades for Girls and Boys which will kick off midway through the U10 and U13 tournament. 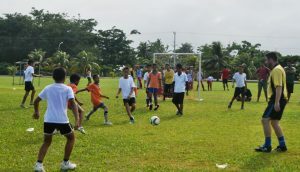 This tournament will be played on a full size pitch with 11 versus 11 players. Spearheading the Youth League Senior Technical Development Officer Martin Tamasese stated the importance of this year’s league. “The Youth league will give players an opportunity to play regularly and also allow the FFS Technical department to identify talented youngsters to be part of our development programs moving forward. Players in the higher grades will also use this tournament to prepare for the Senior National League later this year”. The Youth League is expected to run for the next 10 weeks. Previous Post One door closes, another one opens.